Vilhelm Hamershøi. Untitled (c. 1900) Oil on Canvas. Hammershøi received training at the Royal Danish Academy of Fine Arts, and produced a number of landscapes early in his career. After graduating he submitted a number of portraits to the Royal Academy's annual exhibition, but was regularly rejected. 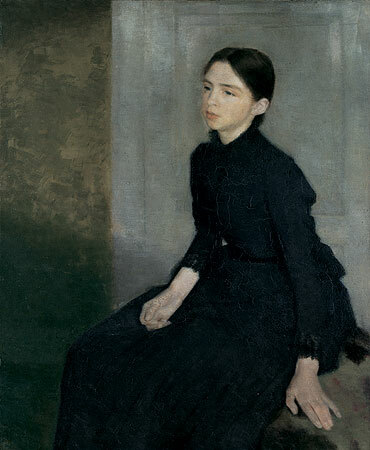 Portrait of the Artist's Sister (1887) Oil on Canvas. Instead of challenging the system, beginning in the 1890s Hammershøi began painting interior scenes of his home that usually featured his wife, Ida. These paintings were generally sold directly to patrons and only occasionally on public view. Vilhelm Hammershøi. Interior with Young Woman seen from the Back (c.1903â€“04) Oil on canvas. Randers Kunstmuseum. 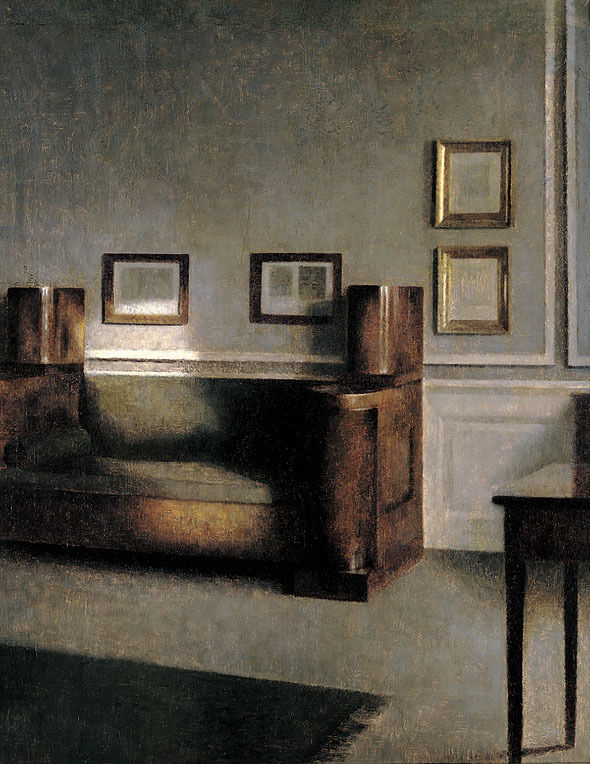 The exhibition catalog often referred to Hammershøi's life as "an uneventful life." 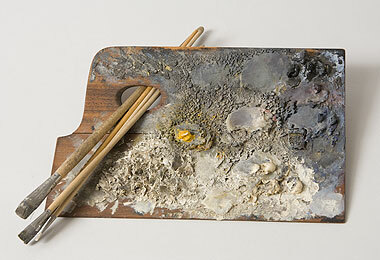 If that's true, I prefer the term "meditative" to describe his paintings. For the past several days, I have been consumed by a deadline-driven project. From the moment I stepped into the exhibition, I was filled with a surpassing peace. The uneventfulness of Hammershøi's works are a wonderful antidote to a busy life. Without realizing it, I spent nearly two hours going from painting to painting. Hammershøi's cool tones and bare compositions are typical of other painters working in Denmark at the time (e.g. Christian Krohg, L. A. Ring, Johannes Holbek). The choice of subjects and the incredible control over the gradation of light in the paintings also begs comparison to Vermeer. However, Vermeer seemed to always have an underlying narrative to his works, and used a very wide palette, including copious amounts of lapis lazuli. 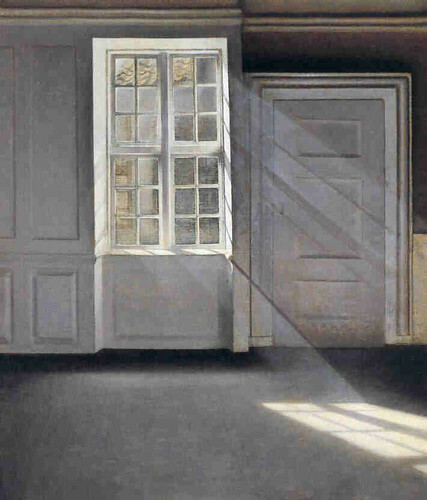 By contrast, Hammershøi seems to have no obvious or hidden narrative and, as can be seen in the photograph (above) of his palette, he worked with an extremely limited range of colors. Vilhelm Hammershøi. Sonnige Stube (1905) Oil on canvas, 49.7 x 40 CM. Nationalgalerie Berlin. 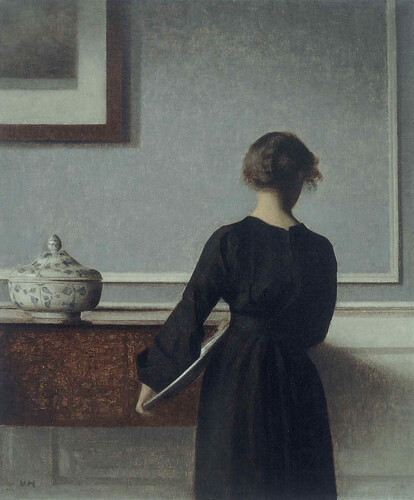 Hammershøi's deliberately visible brushwork and muted colors seems to resemble, above all, the influence the American painter James McNeil Whistler. Hammershøi's journals reveal his admiration for Whistler, who was working both in Paris and London at the time. 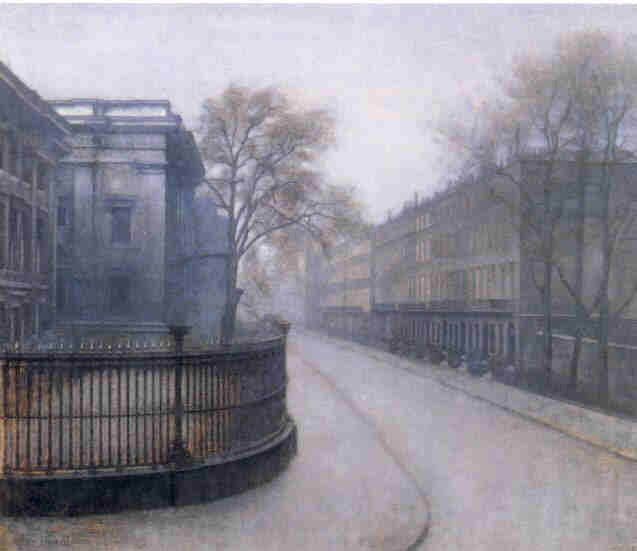 More than once, Hammershøi went to England in the hopes of meeting Whistler; but, whether by poor planning or deliberate avoidance, Whistler always seems to have traveled to Paris when Hammershøi arrived in London. Vilhelm Hammershøi. The British Museum (c. 1905-1906). Oil on Canvas. For an antidote to the ever-busy lifestyle we all lead, I highly recommend finding a Hammershøi painting and sitting in silence for a time.